After the Kingdom-that-never-comes, what does Jesus talk about more than anything else? Love? Forgiveness? Marriage? Sin? No. While he does mention all of these, more of his teaching is to do with money and wealth. When he isn’t speaking about money specifically he’s using it as the background to a parable. Eleven of his thirty-nine parables involve it. He had a thing about money. He resented the wealthy to such an extent he said it was unlikely they’d find a place in his new world order – the famous ‘camel through the eye of a needle’ saying of Matthew 19.24. Come the revolution, he implied, the rich would have their wealth stripped from them (Luke 6.24-25). He consigned the wealthy to Hell, not because they weren’t ‘saved’, but because they were rich and ignored the poor (Luke 6.19-25). He seemed to think being poor was a virtue and that those who were, were especially favoured by God (Luke 6.20). He preached against what he saw as the dangers of wealth and on more than one occasion (Matt 19.21 & Luke 12.33) and advised those with money and possessions that if they wanted God’s approval they’d have to give them away to the poor. 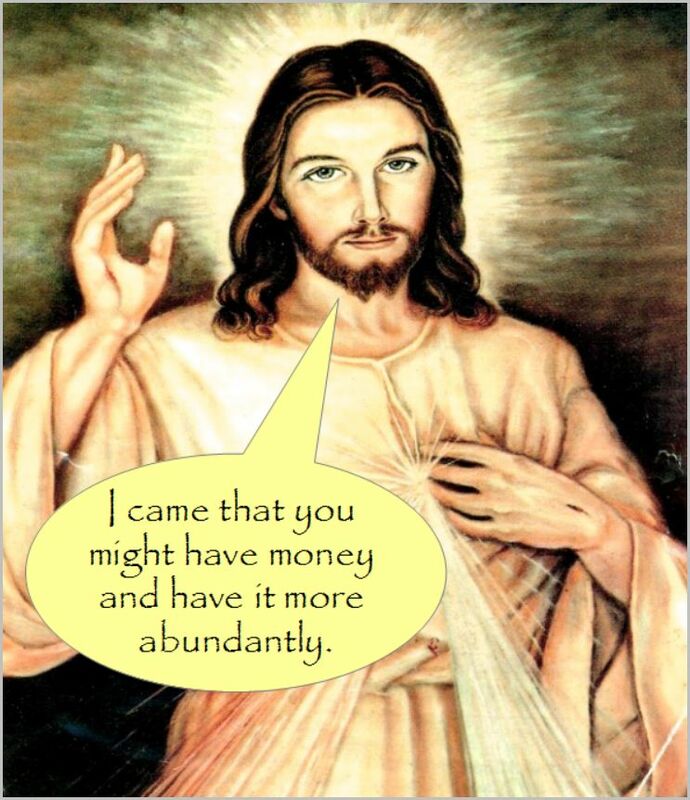 So what do Christians make of Jesus’ evident contempt for money? They certainly don’t give it all away as he said they should. Nor do they see it as an impediment to their salvation, even though Jesus was clear it is (Matt 13.22). As far as today’s Christian are concerned you can serve God and mammon, which is good news – just not Jesus’. Most Christians in the modern west are incredibly wealthy in comparison with the rich of the first century whom Jesus castigated. Take a look too at the incomes of well known pastors and evangelists – Billy Graham is estimated to be worth $25 million, for example; Creflo Dollar $27 million (but he can still beg his flock for $60 million more to buy a new jet) and Benny Hinn $40 million (who did the same a few years ago). You can see why it’s imperative rich Christians get round Jesus’ injunctions about the evils of wealth somehow. What is a Christian to do? What they always do when they don’t like what Jesus has to say: ignore him, or try to explain away what he actually said. So, enter the usual excuses: he was only speaking metaphorically/shouldn’t be taken literally/’really meant’ something else. And what did Jesus ‘really mean’ when he denigrated money? That it’s the love of money that’s the problem – doesn’t 1 Timothy say so? Indeed it does, but 1 Timothy was written a hundred years after Jesus. Already his message about wealth was being diluted; Jesus doesn’t make any nice distinction between possessing wealth and loving it. According to Jesus, having money is to love it (Matthew 6.21). In that case, say those who really can’t countenance surrendering their wealth, money and/or the love of it is really only a problem when it comes between the believer and God. But to believe this necessitates overlooking Jesus’ repeated point that it always comes between the individual and God. Money, according to the radical, demanding Jesus of the synoptic gospels cannot be trifled with; it will always turn those who have it away from God, as well as from those who don’t have any (Matthew 6.21). And that’s the problem, isn’t it. Jesus is – or was – just too radical and too demanding for those who profess belief in him. He can’t possibly mean that they should surrender their wealth and possessions for the sake of their spiritual well-being. And so they do exactly what he said they’d do: they put their money before God. Never mind. They can always campaign against others’ so-called sin or whinge about the supposed loss of religious liberty, about which Jesus says nothing. Just so long as they don’t have to do what he says with their wealth because in an area where they have all the religious freedom in the world, they definitely don’t want to exercise it. This entry was posted in Christian failure, Christian Priorities, Moral Authority?, The impossibility of faith and tagged Christians, God, impossible morality, Jesus, money, religious freedom, religious liberty by Neil. Bookmark the permalink.